Why is Ocean Science Important? My cruise is coming to an end. We are now sampling the last of the stations as we make our way back to Kodiak. On Saturday, we had a safety stand down drill. This entailed finding a spot close to shore where we could drop anchor and then have a little bit of free time. Some people fished for halibut off the boat and others went ashore to explore a little bit. I went ashore with a group that included the XO, Jeff Shoup, Ensign Amber Payne, Glen Whitney, Dennis Boggs, and two of the scientists, Tiffany Vance and Kevin Bailey. We hiked around a part of Katmai National Park and Preserve. 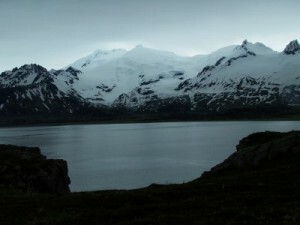 This is an area filled with active volcanoes and glaciers. We saw a brown bear and a fox. 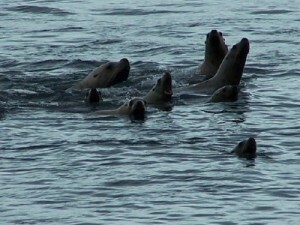 We also saw a raft of sea lions close to shore that eventually came closer and told us to go away. 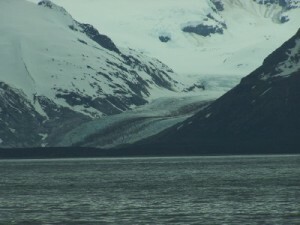 Katmai Preserve is home to an estimated 2,000 bears. The area we visited is very remote with no roads leading to it. Once back on board, it was back to work sampling more stations. My time on board the Oscar Dyson has shown me both the beauty of the ocean and the need for people to understand and care for it. We are inextricably connected to the ocean. Whether we live near or far from the ocean, we depend on the ocean for fresh water (think water cycle) oxygen (the majority of oxygen in our atmosphere is produced by the phytoplankton in the ocean), food, medicines, and mineral and energy resources. Many people depend on the ocean for jobs and recreation. Our oceans, however, are fragile ecosystems that are affected by the activities of humans. Dumping wastes into the ocean, overfishing, drilling for oil and development along coastal areas all have consequences for the living things that call the ocean home. I have learned about areas where overfishing has depleted species of fish that may never come back. There is an area in the Gulf of Mexico that is called the dead zone because of fertilizers from farms dumped into the Gulf from the Mississippi River. Right now, there is the Deep Horizons oil leak that has already spilled 20 million gallons of oil into the Gulf of Mexico and is leaking over 500,000 gallons of oil a day. We have a history of taking the ocean for granted and believing that it is so big that it can absorb unlimited amounts of pollution. We are finding out how wrong we are. Taking care of the ocean is everyone’s responsibility. In order to take care of the ocean, it is crucial that we understand the interrelationships between what we do here on land and what happens in the sea. This is why research such as what the scientists are doing on the Oscar Dyson is so important. Dan 1. – Radar is different from sonar. Radar uses radio waves, a form of electromagnetic radiation (light) to detect objects. Radar stands for radio detection and ranging. Sonar uses sound waves to detect objects. Sonar stands for sound navigation and ranging. Dan 2. – The weather is not nearly cold enough to need the de-icers. I was, however, standing by one the other day and felt the warmth, so they are on. Olivia – My classification on this cruise is officially “Teacher at Sea.” I am, however, included with the scientists. Kylei – I have been very lucky with the weather. We have not had any bad weather. One day, the ocean had some pretty good swells and we were rocking and rolling a bit, but no real storm. It has actually been unusually sunny and mild here. Why are people concerned about this activity? What are people doing to protect the ocean from the negative aspects of this activity? What can you do to help protect the ocean and the life within it? 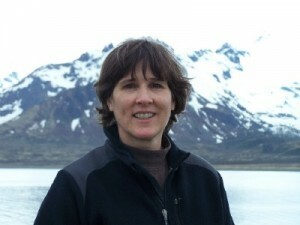 This entry was posted in 2010, Laura Rodriguez, NOAA Teacher at Sea and tagged Alaska, Deepwater Horizon, fisheries, Four Peaked Glacier, Kodiak, Oscar Dyson, stewardship. Bookmark the permalink.